Holding up the Welcome Sign in Romantic Western Illinois! Welcome to romantic travel in Illinois! We’ve put together some ideas for romantic getaways and weekends in Illinois, including honeymoon cabins, small inns, and some romantic and fun places to eat. Many of these getaway ideas would make an easy day trip or overnight getaway from Chicago. 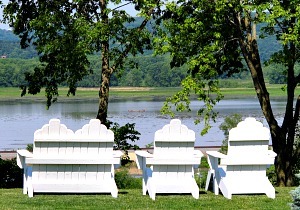 Best Times for Romantic Getaways in Illinois: for comfort outdoors, May to early October is best. Late fall, winter and spring can mean few crowds and great rates at hotels, but be prepared for snaps of cold weather and plenty of snow in the winter. Autumn foliage is often at it's very best in early October, a great time for scenic drives throughout the state. This little jewel of a town in the northwest is one of the most popular romantic getaways in Illinois. It's about 175 miles NW of Chicago, an easy 3 hour drive. Galena is packed with some interesting things to do - there’s the award-winning Galena Winery, the Galena Art Center, historical sites like the Ulysses S. Grant Home State Historic Site or 1859 Post Office, and many beautiful 19th century historic homes and specialty shops to explore. Don't miss a relaxing stroll down main street, or give your feet a rest and a hop onto an authentic Galena Trolley (they have several local trolley tours as well). Stop by to check out some of the specialty shops like Kandy Kitchen and Galena Canning Co. There's wine tasting nearby too: Galena Cellars has their own vineyard & tours a few minutes drive out of town, but you can duck into their Tasting room in Downtown Galena at 515 South Main St. Hot Sauce Sampling at Galena Canning Co! The Goldmoor Inn, one of the Most Romantic Small Hotels in Illinois. This HD video of our stay at the Goldmoor Inn shows a spa tub suite with a great river view, plus the restaurant and some scenes of the beautiful grounds and romantic Illinois countryside outside the inn. Romantic Galena B&B's - there are some very classic and quaint lodging choices for a bed and breakfast in Galena. A couple of nights in a rustic, turn-of-the-century historic inn here will add some romance to your Illinois weekend getaway. 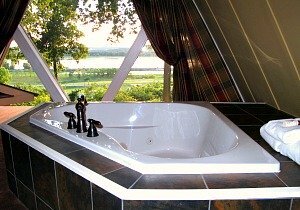 Romantic Utica, Illinois Cabins, Cottages & Rentals - super-romantic cabins and cottages in north-central Illinois, with secluded and lakefront locations, hot tubs, fireplaces, private decks and much more. 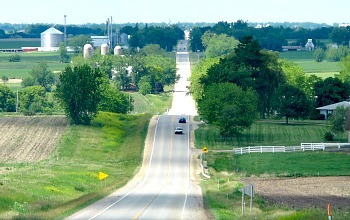 Easy driving distance from Chicago and Rockford, IL. The state capital of Illinois has some worthwhile things to see, including the Lincoln Home National Historic Site. Springfield has lots of Lincoln memorabilia and historic sights; check with the visitor center for details. Route 66 Drive In Movie Theater - Springfield's must-see for an Illinois romantic getaway! Open April to October, admission is $5/adult. And for the complete retro-experience, have dinner first at the Cozy Dog Drive-in, the founding fathers of the corn dog!! Distance from Chicago to Springfield: 200 miles, Driving Time: 3.5 hours. There's some fun things to do here on an Illinois weekend getaway, like the Magic Waters Waterpark, and trying out the go-carts at Rev'd Up Entertainment Center. Or, appreciate the perfectly manicured Japanese vegetation at Anderson Gardens. The River District is the place to go for entertainment, brew pubs and historic walks. Romantic Rockford Hotels: Deals up to 25% Off - including Radisson, Courtyard & Hilton Garden Inn.